Local authorities have increased twofold the price of the admission tickets for the archaeological preserve of the prehistoric, ancient, and medieval rock city of Perperikon, one of Bulgaria’s top archaeological destinations. The Municipal Council in the southern Bulgarian city of Kardzhali has voted an increase of the adult ticket price for Perperikon (also known as Perperik) from BGN 3 (app. EUR 1.5) to BGN 6 (app. EUR 3). The tickets for students and retirees have been increased from BGN 1 (app. EUR 0.51) to BGN 2 (app. 1 EUR), Daniela Kodzhamanova, Director of the Kardzhali Regional Museum of History, has announced. In addition to doubling the ticket prices for the archaeological preserve of Perperikon, the local Municipal Council has also hiked the prices for visiting the Kardzhali Regional Museum of History and the Stanka Dimitrova Art Gallery. Their tickets have been increased from BGN 3 to BGN 5 for adults, and from BGN 1 to BGN 2 for students and pensioners. At the same time, however, the municipal councilors in Kardzhali have decreased the prices for tour guide services in the museum and the art gallery – from BGN 30 to BGN 10, 15, or 20 depending on the specific type of service. September 2014 marked the completion of a project for excavations and improvement of the tourist infrastructure of the ancient and medieval rock city of Perperikon located 15 km away from the southern Bulgarian city of Kardzhali. The project was funded by the EU, and was worth a total of BGN 3.7 million (app. EUR 1.9 million). Lead archaeologists Prof. Nikolay Ovcharov has recently announced that some of the major medieval structures of the medieval Bulgarian fortress of Perperikon, which also harbors a prehistoric, Ancient Thracian and Roman rock city, are to be restored with a grant of a little under BGN 2 million (app. EUR 1 million) from the Norwegian government. Perperikon (also called Perperek or Perperik) is an ancient rock city located in the Rhodope Mountains in Southern Bulgaria, 15 km away from the city of Kardzhali. It is a large-scale archaeological complex including historical monuments from different ages. Those include a megalithic sanctuary dating back to the Neolithic Age, the 6th millennium BC, a Bronze Age settlement, and a holy rock city established by the Ancient Thracians later taken over by the Romans, Goths, and Byzantines, respectively. In the Middle Ages, especially during the time of the Second Bulgarian Empire (1185-1396 AD), it was the site of a strong fortress and a royal palace that Bulgaria and Byzantium fought over numerous times. 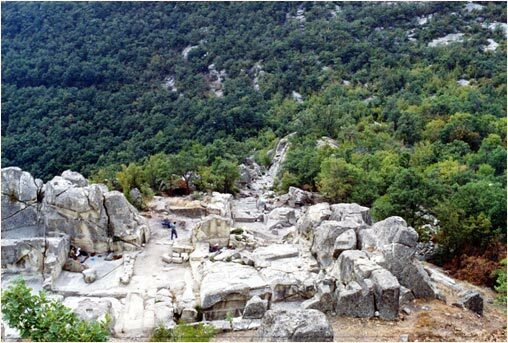 Perperikon has been excavated since 2000 by Bulgarian archaeologist Nikolay Ovcharov who has found evidence that the mythical ancient Temple of Dionysius was located there. The rock city and fortress at Perperikon, not unlike the vast majority of the medieval Bulgarian fortresses, were destroyed by the invading Ottoman Turks in the 14th century.